SKIMFLOW® HPI is a engineered gypsum cement self-leveling underlayment for use over interior surfaces. It can be pumped or poured and delivers high strength, good water resistance and outstanding adhesion. Applications from as thin as 1/8” and as thick as 3” depth can be achieved in a single pour. SKIMFLOW HPI remains flowable for 20 minutes, yet will withstand foot traffic at any depth in 2-3 hours. This product offers high density, yet less finished weight and more flexibility than Portland cement self-levelers. All surfaces must be sound, stable, and clean. Ensure surfaces are free from dust and dirt and any bond breaking materials (silicates, curing compounds, oils). Mechanically remove weak surfaces and any contaminants to sound surface. Always finish cleaning by a final removal of contaminants by vacuum. Any surface must show a tensile pull strength greater than 100 PSI. Any surface with a tensile strength below 100 PSI should be removed mechanically. Do not use chemical cleaners or solvents to prepare any substrate for Skimflow HPI. Adhesive residue should be scraped or ground to well bonded residue only. Check the adhesive prior to mechanical removal to ensure it does not contain asbestos. Always follow federal and local codes when removing asbestos. Gypsum surfaces shall be sound, stable and free of dust. Wood surfaces must follow local codes, be free of deflection, and made of either plywood or APA rated OSB. If necessary, prepare the floor with a lath. Remove all foreign matter by mechanical means. Floor must be free of efflorescence and excess moisture. To check moisture, test with a calcium chloride test (ASTM F1869), or relative humidity (insitu probe) test (ASTM F2170). To correct moisture problems see DEPENDABLE’s moisture protection products. Subsurface must be watertight as SKIMFLOW HPI is extremely flowable. Make sure any holes, cracks, etc. that would permit material through to a lower level are patched or filled with DEPENDABLE WHITE SKIMCOAT prior to priming. Application over textured surfaces generally gives best bond. Extremely smooth, glazed tile must be abraded. Steel trowelled concrete can be scarified or bead blasted to give a suitable surface. A test patch for adhesion should be performed if the installer is in doubt. Before starting installation, establish the level around the area to be filled with a transit, level or laser device. Mark a “do not exceed” level around room or area perimeter by snapping a line or marking a minimum level by setting coated nails or screws just below the level to be achieved. Clean and sweep the floor free from dust and contaminants prior to installation. Pre-wet the oor prior to priming; for particularly porous floors mix PRIMER A 1-to-1 with water as an initial seal. Once the floor is prepared for primer, prime the floor with PRIMER A full strength, and wait until dry or tacky. In most cases SKIMFLOW HPI can be poured directly over wood subfloors. For particularly unstable wood floors, mechanical reinforcement may be required. Staple a lath onto the floor after priming to prepare the floor for SKIMFLOW HPI. Ensure the final primer coat remains wet for 15 minutes, dilute the primer as needed to ensure the final coat is wet for 15 minutes. A test area should be performed to determine the dilution needed, if any. If you must dilute the primer more than 10-1 call Dependable Technical Services for assistance. Clean and sweep the floor free from dust and contaminants prior to installation. Gypsum concrete must be sealed prior to installing SKIMFLOW HPI. Dependable’s GSL® ACRYLIC SEALER or ACRYLIC EMBOSSING ADDITIVE may be used to seal the floor. After cleaning, mix your sealer 4-to-1 with water and apply a first coat onto the gypsum concrete. After first coat of sealer is dry (minimum 1-4 hours), apply second coat of sealer and allow to dry. Once sealer is completely dry, prime the floor with PRIMER A full strength. The installer must remove any poorly bonded adhesive residue mechanically. Once the adhesive is removed, prime the floor with Dependable PRIMER A, ensure the primer coat remains wet for 15 minutes, dilute the primer if necessary. Dependable recommends the use of PRIMER A on all surfaces, unless specified by technical services. Check the porosity of the substrate prior to priming. Fill a bottle-cap with water, and drop onto the surface. If the water disappears readily, consider the surface porous. Porous Substrates: On porous substrates it is necessary to dilute the primer prior to installation, a test area should always be performed prior to priming the entire floor. Dependable recommends starting at 4-1 ratio, but it is important to remember that each substrate may require a different dilution ratio depending on the porosity of the substrate. Ensure the primer remains wet for 15 minutes after application. If the primer remains wet for less than 10 minutes, increase the dilution ratio and try again on the test area. 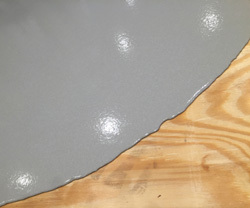 If the primer remains wet for more than 10 minutes, but less than 15 minutes: increase the dilution ratio, but continue priming the remainder of the floor. Dependable recommends installing the primer into the floor with a soft bristle broom, but a nap roller or a squeegee may be used if necessary. Mix 1 bag SKIMFLOW HPI into 4.75-5.25 quarts of cool clean water. (10 lbs. to 1 qt. water or 5kg. to 1 liter water). SKIMFLOW HPI can be mixed in large quantity in mortar mixers or special pumps or in smaller quantities (up to 2 bags) in a 20-40 gallon container. Use only a very clean mixing container that does not contaminate SKIMFLOW HPI with other material. Pour in proper amount of water and then add powder while mixing. Do not over-water. If a problem is encountered while mixing and you are not getting a lump and powder free mix, try starting with 2/3 of proper water, adding powder until just wetted, then adding remainder of water and thoroughly mix at 850-1200 RPM. Mix for at least 2 minutes, but no longer than 3 minutes to a homogenous lump-free mixture. Do not shake. When mixing Skimfow HPI in large pump applications, start the mix at low water (4.75 quarts) and modify water ratio as needed within the approved range. Ensure Skimfow HPI does not segregate on the foor, for best results. Pump or pour contents onto floor. Because SKIMFLOW HPI is very flowable, allow it to build in one area until it reaches at least desired depth and maintains that depth even as material flows away. Begin at a corner of room or at a deep part of fill. Plan the pour before starting. Either work back and forth along a line of the room or from the center of the fill outwards in all directions to keep pouring against the freshest material possible. Lightly work the transition points between pours and material over or under desired depth with a screed, spreader, lightweight float or straightedge to the desired depth. Material should remain highly flowable for 20 minutes and can be walked in for over 45 minutes at normal temperatures. Any imperfection can be smoothed by surface trowelling or drawing a straightedge or smoother over the surface. As material gets stiffer and begins to gel, it may be smoothed or trowelled to a featheredge. Once material begins to gel, stay off the area for about 1.5-2 hours, after which floor should bear foot traffic. In very hot or windy conditions, protect from wind and mist fog floor. Direct sunlight, heat and wind can cause rapid drying of the product which may reduce working time. To avoid rapid drying, provide protection against these elements. Let material continue to dry before covering until evaporative moisture lessens. Moisture level may be checked by a surface moisture meter, a plastic film taped to the floor, or a plastic bucket left on the floor and the area carefully observed for residual surface moisture upon removal. In thin 1/4” applications, SKIMFLOW HPI may be covered in 4-24 hours depending on drying conditions (temperature, humidity, thickness) and requirements of adhesive and floor covering. For impervious coverings (vinyl, laminate, etc.) be sure SKIMFLOW HPI is thoroughly dry (at least 16-24 hours). Pours deeper than 3/8” require longer time or forced drying. Multiple lifts: Skimfow HPI may be poured in multiple lifts, consult Dependable Technical Services for details. NOTE: Temperature and humidity levels affect the drying characteristics of SKIMFLOW HPI. However, unlike Portland cement materials, SKIMFLOW HPI may be force dried with the use of heat or fans once set. • Where hydrostatic pressure (water) is present or moisture emissions exceeds level permitted for installed floor covering. SKIMFLOW HPI Underlayment can tolerate any amount of moisture from a concrete slab so long as all of the moisture from the slab will escape past the floor covering. If the floor covering’s moisture permeability does not meet or exceed the moisture content of the slab, Dependable recommends moisture remediation. Use Dependable’s Vaporseal HM, or an approved alternative, to remediate moisture in concrete, consult the Vaporseal HM data sheet, or call technical services, for more details. • Where surface or ambient temperature falls to or below 45°F 72 hours before or after installation. • Over presswood, particle board, masonite, chipboard, single stripwood floors, luaun or similar dimensionally unstable materials susceptible to moving or swelling. • Pouring Skim ow HPI in an uncontrolled environment with uctuating humidity, direct sunlight exposure, air movement, and temperatures may cause differential drying. Control the environment to the best of your ability for best results.